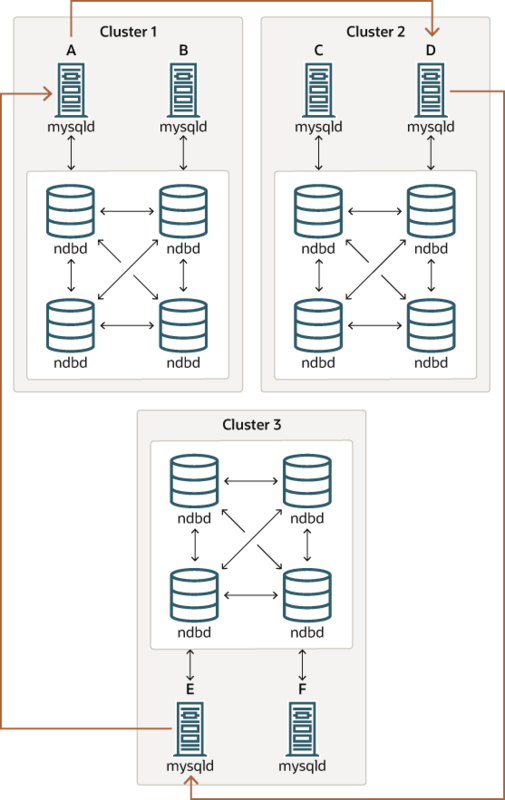 This section discusses known problems or issues when using replication with NDB Cluster 7.3 and NDB Cluster 7.4. The replication master issues a “gap” event when connecting or reconnecting to the master cluster. (A gap event is a type of “incident event,” which indicates an incident that occurs that affects the contents of the database but that cannot easily be represented as a set of changes. Examples of incidents are server crashes, database resynchronization, (some) software updates, and (some) hardware changes.) When the slave encounters a gap in the replication log, it stops with an error message. This message is available in the output of SHOW SLAVE STATUS, and indicates that the SQL thread has stopped due to an incident registered in the replication stream, and that manual intervention is required. See Section 18.6.8, “Implementing Failover with NDB Cluster Replication”, for more information about what to do in such circumstances. Because NDB Cluster is not designed on its own to monitor replication status or provide failover, if high availability is a requirement for the slave server or cluster, then you must set up multiple replication lines, monitor the master mysqld on the primary replication line, and be prepared fail over to a secondary line if and as necessary. This must be done manually, or possibly by means of a third-party application. 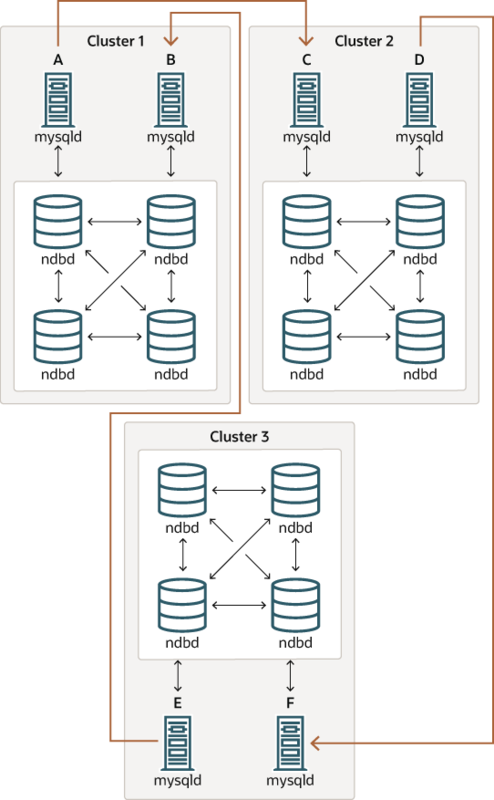 For information about implementing this type of setup, see Section 18.6.7, “Using Two Replication Channels for NDB Cluster Replication”, and Section 18.6.8, “Implementing Failover with NDB Cluster Replication”. Every NDB table is implicitly partitioned by key when it is created. See Section 19.2.5, “KEY Partitioning”, for more information. This is because the slave may not be able to separate transactions occurring in one database from those in another if they are written within the same epoch. 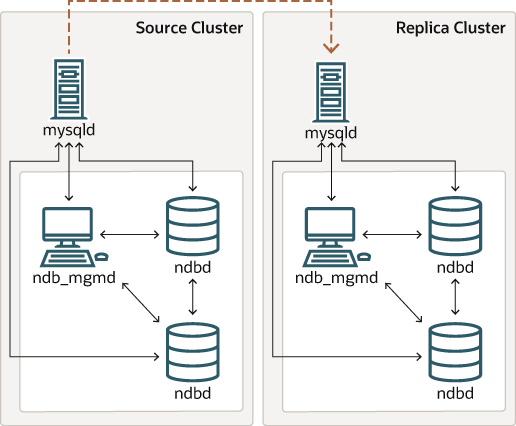 In addition, every transaction handled by the NDB storage engine involves at least two databases—the target database and the mysql system database—due to the requirement for updating the mysql.ndb_apply_status table (see Section 18.6.4, “NDB Cluster Replication Schema and Tables”). This in turn breaks the requirement for multithreading that the transaction is specific to a given database. Restarting with --initial. Restarting the cluster with the --initial option causes the sequence of GCI and epoch numbers to start over from 0. (This is generally true of NDB Cluster and not limited to replication scenarios using NDB.) The MySQL servers involved in replication should in this case be restarted. After this, you should use the RESET MASTER and RESET SLAVE statements to clear the invalid ndb_binlog_index and ndb_apply_status tables, respectively. Its own --replicate-do-* or --replicate-ignore-* option, and that multiple rules cannot be expressed in a single replication filtering option. For information about these rules, see Section 17.1.4, “Replication and Binary Logging Options and Variables”. Its own --binlog-do-db or --binlog-ignore-db option, and that multiple rules cannot be expressed in a single binary log filtering option. For information about these rules, see Section 5.4.4, “The Binary Log”. However, all connections originating within the NDB Cluster—represented in the preceding diagram by solid arrows—must use IPv4. In other words, all NDB Cluster data nodes, management servers, and management clients must be accessible from one another using IPv4. In addition, SQL nodes must use IPv4 to communicate with the cluster.